This article shows you how to recover deleted notes on iPhone 5 without backup being necessary and this method is for FREE! I recently deleted notes on my new iPhone and found a way to recover them. You can read the article (link below) if you need to recover from a newer iPhone. I wondered can I recover deleted notes on an iPhone 5 as well. Yes – here is how. 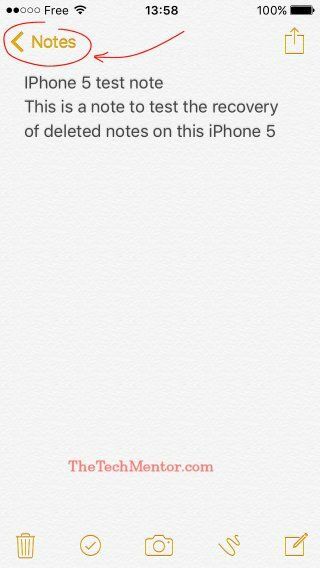 Luckily my wife has an iPhone 5 so I checked with her and indeed she had deleted notes. She asked “how can I recover deleted notes on my iPhone 5?” I showed her using the method below. 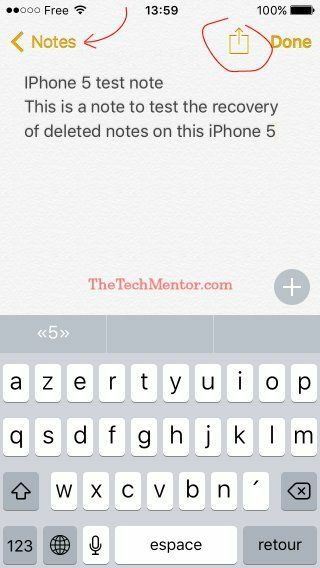 It works to retrieve deleted notes on iPhone 5 or iPhone 5s, even if you have deleted several notes. Read on, it’s super quick! If you have a more recent phone, like an iPhone 6 or iPhone 7 you want to follow the steps in my other article. Here’s the link to my other article called how to recover deleted notes from an iPhone 6 and 7 free. Now to recover notes on your iPhone 5 is very similar. Though there are some similarities, it is not exactly the same. It’s only slightly different. But I wanted to make it clear and easy with screen shots so it is easy to follow. Read on below to see how it is done, with annotated screen copies from my wife’s iPhone 5. How to recover deleted notes on iphone 5? How to recover deleted notes on iPhone 5 without backup? How to recover deleted notes on iPhone 5 for free? The screenshots below show you step by step. If you are Starting from within a note, tap at the top left of screen, once on the ‘Notes’ word (top left of screen). Then tap once on the back arrow (<) at the next screen (not shown, but it’s in the same place). Step 2 Look for the Recently Deleted Notes Folder line. 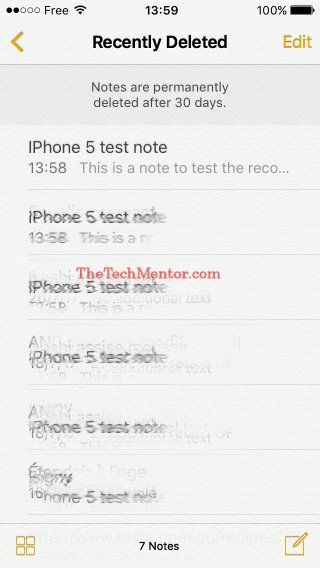 If you have some iPhone Recently Deleted Notes saved, they will look like the highlighted row below. If you deleted you notes without backup, do not worry as this is where Apple have temporarily stored your deleted notes. Step 3 Tap on the row or text to select and view all the recently deleted notes. If you have several deleted notes they will appear in a list with a little of the text of each note so you can tell which ones they are. Tap the note in the list and the entire note will pop up. This note is not yet ready to use. It looks like your note, but it is still in the Recently Deleted notes folder at this point. Be warned that if you delete by tapping on the trash icon at this point you will remove your note. That means remove it from the recently deleted notes section. If you do, you will no longer be able to recover the note after that (using this method). So be careful not to do it unless you really want to remove any sign of that note. Note that you can’t edit or send the note from here. You need to recover the note from this folder first. Step 5 Tap as if you are going to edit. This will bring up a message like in the screen shot below. You can cancel or tap recover – this is the trick to how to recover deleted notes on iPhone 5 without backup. Select Recover when prompted and you have finished. Simple! That is how to retrieve deleted notes on iPhone 5! 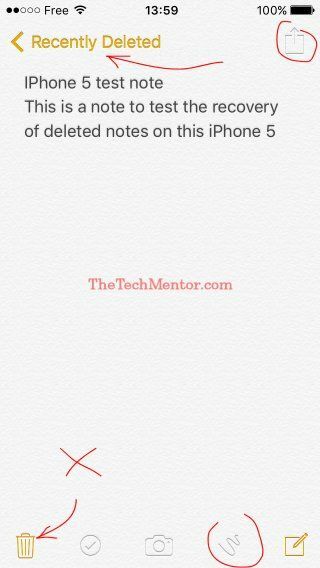 It’s exactly how you can retrieve deleted notes on the iPhone 5s too. Your note is still visible on the screen, but some subtle changes on screen indicate that the note is now back within the normal notes folder. For example you can now send the note (the send not is back to the normal icon and is no longer greyed out). Contrast the above screenshot with the one below to see what I mean. 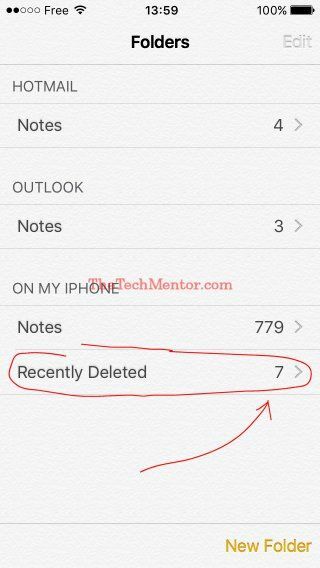 If you deleted more than one note on your iPhone 5, and you want to recover more than one note, you can go back to the recently deleted notes folder again and retrieve your other notes by repeating the above steps. You might think it is pretty straight forward once you know how. But that is the case with anything to do with computers and smartphones in general. The great thing is when you know, you can help yourself if it happens if you have a iPhone 5 or help a friend or client. It’ll make you look good! 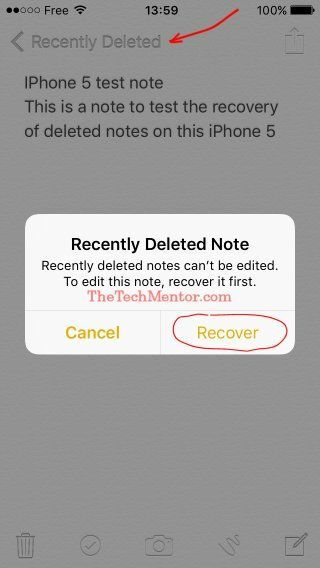 Apple iPhone notes recovery – Can you recover deleted notes on iPhones othe than the 5? This means that if you have an iPhone 4 like my old one, then you are not able to recover your deleted notes this way. Retrieving notes on iPhone 5? As you know, this post covers how to recover deleted notes on iPhone 5 without backup. This procedure is very similar to the steps necessary to recover deleted notes from an iPhone 6 and iPhone 7. What Happened in My Situation? In my case I deleted notes accidentally during the night. Something to do with my eyes squinting in the dark! In the morning I had to get my deleted iPhone notes back. 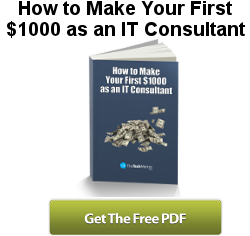 So I did some searching and found a site or two that helped, and some that want you to pay. They didn’t exactly show what I was looking for. One comment I saw helped because it gave me the clue about the iPhone deleted notes folder. So I researched that. Then I tested and I thought ‘Wow! This is so easy I need to show others this.’ Hence the idea to write the original article, and now this one. I found iPhone notes recovery is easy and for free thanks to the design of the iPhone Recently Deleted Notes Folder. Having my wife’s iPhone was handy. When I wanted to see if I could do it on hers, she asked “how do I recover deleted notes on my iPhone 5?” Since she was keen to recover some deleted notes, I ran the tests specific to that model on hers which allowed me confirm you can recover deleted notes on them. (I’m sure you’ll find the iPhone 5s is so similar it’ll work just fine on those too). It also enabled me to take the screenshots above. At TheTechMentor.com, we love to show you how to recover deleted notes and files of all sorts. For example, our most popular article shows how to recover deleted notes after emptying from the recycle bin. As you have an iPhone, you might also have a Mac computer, and there are solutions for both PC and Mac there. This article shows how to recover deleted notes on iPhone 5 without backup by retrieving them from the Recently Deleted Notes folder built in to the iOS for your phone. In other words, luckily the iPhone 5 (or should I say thanks to Apple) with its recent iOS stores deleted notes files in this folder specifically so you can retrieve them up to 30 days later. By selecting this folder and choosing your notes in turn, you can select to recover several deleted notes on an iPhone 5. You can see this method works without backup and it is totally for free!